WILLEMSTAD - The technology group Wärtsilä was awarded the contract to supply a 39 MW power plant to Aqualectra, the utility company of Curaçao. The turnkey project will provide much needed additional generating capacity and provide Aqualectra with the fast starting capacity and flexibility needed to add more wind power capacity to the island's system. The company already has more than 46 MW of installed generating capacity from wind energy and plans to add more renewable energy generation in the near future. The order with Wärtsilä was booked in October. The new plant will operate on four Wärtsilä 34DF dual-fuel engines running initially on heavy fuel oil (HFO), but switching to liquefied natural gas (LNG) fuel at a later date. The Wärtsilä solution will add needed reliability to the grid, and when running on LNG will notably reduce the utility's environmental impact. The plant will be equipped with continuous emissions monitoring capability. "The reality is, we need more generating capacity to meet our growing demand for energy. And, given the focus we have put on increasing our renewable capacity, we are conscious of the fact that the output from wind power and solar are inevitably intermittent. Hence our requirement for a plant that can start quickly and ramp up to full output in a matter of minutes. The flexibility provided by the Wärtsilä engines will allow the necessary balancing, and is just what we need," explained Mr. Darick Jonis, Acting Chief Executive Officer of Aqualectra. "Aqualectra has been a customer of ours for more than 20 years, and they have two power plants from Wärtsilä already operating with a combined output of 96 MW. Naturally, we are honored to have again been selected to serve their needs with this Smart Power Generating unit," commented Rodney George, Vice President, Caribbean, Wärtsilä Energy Solutions. The Wärtsilä equipment is scheduled to be delivered in mid-2018, and the plant is expected to be fully operational in November of that year. 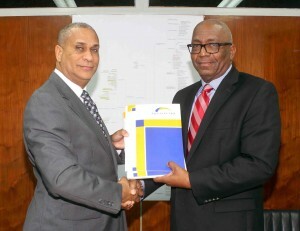 Photo: The agreement was signed by Mr. Darick Jonis, Acting Chief Executive Officer, Aqualectra and Mr Rodney George, Vice President, Caribbean, Wärtsilä Energy Solutions.